26, of Greenville, assigned to Carrier Airborne Early Warning Squadron 120, based at Norfolk Naval Station; died Aug. 15, 2007, in a plane crash shortly after launching an E-2C Command and Control Aircraft from the USS Harry S. Truman aircraft carrier. To honor LT Jerry R. Smith, his brother, Mr. Eric Smith retrieved this stone with the help of their mother, Fonda, from a flower garden from their childhood home in Greenville, Maine. Anyone who hikes this stone needs to know that Jerry was an athlete. He loved hiking and had a very strong sense of humor. He was witty, funny and super sarcastic. His quick wit was unmatched. He was known sometimes to have a crooked smile, but it was his way of making light of even the most stressful situations and finding the bright side. He had a very good sense of perspective. Jerry came from a family of public servants and military service is a very strong tradition in his family. Both his grandfathers, his uncle and several great uncles served in uniform. Jerry knew it was the right thing to do, not only for himself, but for the country and the legacy that was protected by his family. Jerry was strong in the classroom too. He was a good student but he also knew how to enjoy life and be silly. He wore the best 80’s costume at a Journey concert one time and made everyone jealous with his extreme 80’s style. He cherished his time at Kings Point where he loved the sense of Comraderie and Teamwork he learned. He practiced those traits an took them into his Navy career — helping others and working toward the collective goals. He has another little known fact — He actually enlisted in the Marine Corps and spent a short time on a Marine Corps contract. On October 4th, I took part in the Summit Project, which is a living memorial for fallen Maine soldiers. Along with my wife, 80 hikers converged on the top of Cadillac Mountain at Acadia National Park along the beautiful coast of Maine. I was responsible for carrying the stone of Navy Lieutenant Jerry Smith. Jerry went to high school with myself and my two older brothers. We were in the same athletic clique and his brother married into the family. I knew this day was going to be very meaning. With all meaningful projects, I had an overwhelming sense of purpose at the end of the day. Our day started around 4:45 in the morning. We woke to darkness, drove in darkness and arrived at Thompson’s Island in darkness. We pulled into a parking spot and left the headlights on as we saw we were not the first to arrive, however the people there were hastily working away with headlamps on. I remember feeling a little out of place. I had no military background, but was surrounding by decades of experienced soldiers and families all having prior relationships, giving hugs of meaning to each other. My wife and I packed our stuff, met our fellow hikers in the group and I made it a point to remember everyone’s name, to make things personal. Team Kebo loaded the bus and the air was filled with fog, wind, anticipation, chit chat and stories of missions past in the back. We reached our extraction point, gave a quick stretch to the legs and marched upward. The rocks were slick and the trails covered in wet, colorful leaves. The foliage was in full array, although difficult to see past the fog. My first thought of the hike: “Well, this is where I start to think about what Jerry would do or say. He’d give a crooked smile and simply say Let’s Get Going”. Aside from a couple of slips, trips, rain and wind, our team made it to the summit first (although I was told this wasn’t race, but if it had been, Team Kebo won) and had our summit ceremony. Stories of research were told of each hiker. I talked of how bright and driven of a person Jerry was and how proud and honored I was to be able to carry his stone and hand deliver to his brother at base. I spoke of earning his wings of gold and his high marks and abilities to fly. After a group photo, we waited for the other teams to arrive and continued to make bonds. Upon arrival back to base, I was greeted with a surprise; Jerry’s mother was waiting for us. I wasn’t aware she was going to be present but the embrace of her with tear in eye immediately brought the power of the project full circle. Humbled is the closest feeling I can use to describe when she thanked me for taking Jerry’s stone. We spoke for several minutes as my wife and I shivered to stay warm. A change into dry clothes and belly full of amazing home-cooked food, it was time for the culmination of the day; the stone hand-off to the Patriot Riders. Aligned in opposite rows, I walked over to Art and handed him Jerry’s stone, stating: “This is my friend Jerry. Jerry and I went to high school together. I’m really glad you’re going to be taking care of him”. With a nod of the head, Art accepted the stone and I went back to my line to see them ride off, stone securely in place. I like to believe there are few instances in life that change your perception of the world. The Summit Project was definitely that instance for myself. I realized how strong the human spirit is, how family is not contained by a name and how great our military is. I learned Jerry Smith provided us with support in our navy. I learned he was a man who loved to make others laugh, hike, and be an athlete. I’m very thankful for his service. Carrying his stone to the top of the mountain gave me a sense of meaning. It showed me the importance of what he did for us, for our country. He was only 26 years old when he passed away, and I know he still had so much ahead of him. So much life was taken away from such a young, courageous man. When I was carrying his stone up the mountain, I thought of the love Jerry had for hiking — so I hiked for him. Even though Jerry wasn’t related to me but by reading his bio, and thinking about him the whole time while hiking up the mountain it really got to me. It got to me because when we got to the top we presented what we learned and thought about our soldier, and then hearing about the other young soldiers that died, because they haven’t even lived their life, they just started their journey and ended it to protect their country. Jerry Smith was 26 when died in an airplane accident. After I read his bio to get to know more about him when he was younger in school, and he seemed exactly like a normal student a lot of people like him and he was involved in sports and was a humorous guy. After going on the field trip for the summit project I gained knowledge of what it feels like losing somebody, more people should do this project because they become more aware of what they are grateful for I am glad that I got to go hiking for Jerry because he enjoyed hiking himself, and I got to notice him out of thousands of other soldiers, and became thankful for his service. I took part in the Summit Project for a field trip with my school and I think that so many people and schools should take part in this. It is a good way to really feel the meaning of these young soldiers who lost their lives fighting for our country. I didn’t know Jerry but just by reading his bio I could take a quick look into the life he lived and he was just an ordinary guy who was very brave and served a great purpose in defending our country. He died at 26 and lived such a very short life. Taking part in this hike you really feel the weight of someone’s life as you carry the stone up the mountain. You feel the sadness of the lost life. The energy used in the hike is only a fraction of the tiredness from all the training they had to go through. Jerry was an athletic, friendly man who was loved by many and will always be missed. On November 11th I participated in the Bangor/Brewer Veteran’s Day Parade handing out flyers to the crowd to help get the word out about the Summit Project. Well, that was what people saw at least. The days leading up to the parade I had been in private contact with Major Cote about carrying Jerry’s stone all day. The day before the parade I made the arrangements to pick up his stone in Newport and woke at 4am on the 11th to ruck his stone to the starting point of the parade to meet with our amazing team of Marines that would be escorting the rest of the stones in the parade. On the trek into Brewer I had the time to think about all the connections I had with Jerry. From his bio I had learned that he was witty and sarcastic and had a sly smile when it came to taking on stressful situations. Anybody who knows me would say the same of me and it was this trait that drew me to his stone and story. Always making the best of a bad situation is something I think we both had in common. I’ll never get to meet Jerry, but he was in my thoughts all day long. I carried his stone a total of 16 miles on Veteran’s day and we watched the sun come up that morning. The entire time I was smiling just knowing he was with me in spirit. I e-mailed Eric prior to my hike and I hadn’t heard back from him for a few days, but when I did I was blown away with our connection. The world shrunk a lot that morning when I found out you have the classroom directly across the hall from my wife and we had no prior knowledge of this. I’m honored to have made the connection with you and your family. Jerry was a true hero and will never be forgotten. I shook a lot of hands and gave a lot of hugs to Veterans I met throughout the day. One pulled me aside and asked me if I was carrying a stone with me in my ruck. I told him about Jerry for a few minutes and this tough old man was in tears when I was finished. I was too. The Summit Project is bringing together our state with it’s message. It was hard to put Jerry’s stone back in the van at the end of the parade for it’s trip back to Portland, but necessary for Jerry’s next great adventure with somebody else. On the onset it looks just like an engraved stone. Just a rock somebody found and had letters carved into it, but it’s when you find out about the amount of love and heartache which has been poured into it you find something new in yourself. On 25 December 2014, I had the privilege to hike Borestone Mountain with three other fellow TSP hikers. I carried the stone of LT Jerry R. Smith. I grew up in Greenville Maine where Jerry and his family are also from. I attended the Greenville school system up through eighth grade and recall seeing Jerry always playing sports and cheering on his brother Eric during various sporting events. I heard of The Summit Project while I was deployed to Afghanistan last year and I knew from the onset that my first hike would be in honor of Jerry. It has been many years since I have had the opportunity to go back to Greenville or see any of the Smith family but you never forget where you came from. The Summit Project and this opportunity has bridged that gap. It has warmed my heart and I truly feel blessed to pay homage to Jerry and the Smith family. Upon parking our vehicles at the base the rain lifted and the sky opened clear blue. I turned to my friend Kirsten and said “this is a sign” it was like the hero’s that we were hiking for were looking down upon us. Words cant convey the emotion that flowed through my body as we began our summit. As a Soldier I take great pride in serving our country for our freedoms, our families, and to never forget our fallen brothers and sisters in arms. Hiking to the summit of Borestone on Christmas day in honor of LT Jerry R Smith will forever be a memorable day for me. I want to thank you Smith family for your sacrifices and know that Jerry’s memory will continue to live on. With great respect and admiration.. Thank You! My name is Alexandra Shapiro, I am a Junior at Falmouth High School, and I carried Jerry’s stone. This hike was one of the most memorable and emotional events I have ever been a part of. I had no idea how powerful this would be and how much the living memorial hike would affect me personally. I don’t really have any personal connections with any fallen heroes or any veterans, however I found that despite this fact, I felt very connected to Jerry. Jerry was an athlete. His dedication to sports and his dedication in general is what pushed me through this difficult hike. It was an amazing experience and truly opened my eyes to the importance of remembering Maine’s fallen heroes. Jerry will never be forgotten, I will remember this experience forever and I will remember Jerry. I am honored to have carried his stone, and I am so sorry for your loss. thank you Alex for carrying my brothers stone! It means a lot to all of us! On 26 September 2015, I was honored with carrying Jerry’s stone for the 8-mile march from the Maine Veterans Home in Bangor to the UMO Football stadium. Prior to the march, I learned of Jerry’s devotion to service. Unfortunately Jerry left the Navy about the same time I was putting in work to enter it, but in Jerry’s story I saw my own mortality and the risks I and every other sailor undertake when we take off into the air or under the water. Risks we take sometimes daily without questioning because they are part of our duty. As I carried Jerry’s stone I thought about how if Jerry were here today, he would have taken up the stone of another for the day’s march. On October 17, 2015 I had the distinct honor of carrying Jerry’s stone up Cadillac Mountain with The Summit Project. This is the story of my journey with Jerry. About a year ago, as I prepared my classroom for the day, Eric walked across the hallway and asked me if I had a minute. I said sure. He asked me many questions and before I knew it he said, “Jerry is my brother.” I took a deep breath. I was speechless. My husband carried Jerry’s stone as a tribute in the Veteran’s Day parade the week before. On this ordinary school day, in a matter of minutes, I learned the true meaning of serendipity. In that moment, I had an overwhelming sense of duty. I had to carry Jerry’s stone. As the months passed, I prepared physically and mentally. I had never climbed a mountain. I had a new purpose, in order to honor Jerry’s memory and was determined to do the right thing. The physical preparation was fun, hiking with my husband and son. Many times, as we were out adventuring, I would think about my son and that Jerry was a son. I am a mother. I remembered that he liked hiking and that gave me comfort. The mental preparation was much more profound, for as I talked with Eric about Jerry and researched a little on my own, I realized that our lives intersected once more. A few months ago, I learned that Jerry earned his gold flight wings on May 5, 2006. This must have been one of the proudest moments of his life. He, on that day, was a Naval aviator. As I read about him on that day, I found myself staring at the date: May 5. May 5 is my brother’s birthday. Jerry was a brother. Serendipity. I was meant to carry his stone. On the morning of October 17, my husband and I arrived at Thompson Island at dawn. Before the hike, I offered to lend a hand organizing the stones. The stones were in their cloth bags and needed to be placed on tables for the hikers. The first stone I picked up was the one nearest to me, covered in its blue cloth bag. I pulled open the drawstring with one hand, while holding the weight of the stone in the other. I reached into the bag and uncovered the stone. J. R. S. LT. USN 1981-2007. Jerry. I clutched the stone and wept. Inside I said, “Good morning, Jerry.” I carefully placed his stone in my pack and prepared to hike. I set out to hike with an optimistic view and was challenged by rain and sleet. I focused on what mattered: Jerry, and asked him to give me the perspective necessary to focus on my purpose with The Summit Project. I soon lost all notions of negativity and focused on the beauty of the rain and how the earth glistened and shimmered. Mid-way up the mountain our team paused for a moment of silence. I said a prayer for Jerry’s family and asked him to forgive me for not dressing in “80’s style”. I intended to wear something neon colored, in his memory, but that did not work out and I was disappointed in myself. It continued to rain. We hiked on. Then, a little while later, all of a sudden, the clouds parted and a rainbow appeared. I asked the team to pause and look. I thought I was worried about wearing neon? Well, this was all the color I could have asked for. What a powerful sign that meant something different to all members of our team. A symbol of hope, beaming over the harbor as far as the eye could see. Out of everything, the most difficult part of the day was not the hike. It was the stone ceremony at base camp. I stood in the biggest circle of people I have ever been part of, but felt a complete sense of belonging. The vastness of The Summit Project overwhelmed me: the lives of the fallen, the living, the hope. I was there with Jerry’s stone in my arms waiting to return him to Justin. I was comforted knowing Justin was there to receive the stone. What I did that day became intensely real when I said out loud,” I carried the stone of Navy Lieutenant Jerry R. Smith.” I could not speak anything more. I met Justin half way across the grass, handed him Jerry’s stone and as he said, “Thank you,” I knew had a personal connection to Jerry. It was meant to be. As a former military member, I immediately embraced the opportunity to honor a fallen Maine veteran by participating in The Summit Project’s hike at Baxter State Park. I was extremely supportive of TSP’s vision to not only honor the fallen soldier but remember them in such a meaningful way. The honor of carrying the stone and the story of a fallen Maine veteran only intensified as I got to learn about LT Jerry Smith. I felt very connected to Jerry as we both served as Lietenants in the United States Navy. We were both athletic and had a great sense of humor. Knowing the characteristics we had in common, I felt even more sense of purpose in carrying Jerry’s stone. Twelve hikers on my team ascended the Owl Trail at Baxter State Park that day. The hike was extremely meaningful in many ways and I was honored to speak about Jerry and his service. When I tired that day, I thought about Jerry and the ultimate sacrifice he made. Thank you for allowing us to honor and remember Jerry. Today Greg Johnson and I hiked up Table Rock Mountain in Maine with 44 children who all have a parent or sibling currently serving in the military. They carried 27 stones up the mountain today. Here is a letter from the campers that had the honor of carrying your hero. “Today we were honored to carry forth the stone in honor of Mr. Smith. Not only were we able to carry this stone but we were also able to connect with him through his biography. Both of us share common characteristics with Jerry such as his athletic abilities, love of the outdoors, and his ability to learn in the classroom. Both of us felt a strong connection with this hero even though we were only able to spend a short day with him. We feel very unfortunate for the loss of such a talented young man, though we appreciate his heroism and bravery in the protection of our very own freedoms. We appreciate the ability to spend a day learning about a true American hero such as Mr. Smith and feel sorry for his unfortunate passing. “I may not have known him but having the honor of carrying him on out hike was incredible. He seemed like someone I would have hung out with and I would like to thank you for the opportunity to carry such an awesome person’s stone. I hope this finds you all well. This past Sunday July 31st, I had the honor of hiking Borestone Mountain with Jerry’s stone. My wife Hillary and I were invited to participate with a small group of Foxcroft Acadamy alumni led by Kirsten White who is very passionate about The Summit Project. This was the first time we had participated in a TSP event and we did not know what to expect. The whole experience was very humbling for me, an experience I will never forget. At the top of Borestone we gathered together to honor and talk about our service members. Fortunately, I was lucky enough to have known Jerry personally. I was able recount few personal memories I had of Jerry. As children I remember watching the 4th of July fireworks over Moosehead Lake from Richie’s house. I also remembered the last time I saw Jerry. In 1999 while he was at Kings Point and I was working on Long Island we flew back home on the same flight for Thanksgiving. He was in his uniform and remember being struck about how grown up and professional he looked. Jerry ‘s and all of our services members and their family’s sacrifices have made our world a better a place. I hope to have the privilege again of taking Jerry’s stone on another hike in the future to help ensure the memory of Jerry and his and your sacrifices live on. Today (8/27/16), I had the honor of carrying the memorial stone for Navy LT Jerry R. Smith, along with six friends. Jerry was from Greenville, Maine, and just 26 years old when he was killed in a plane crash shortly after launching an E-2C Command and Control Aircraft from the USS Harry S. Truman aircraft carrier. 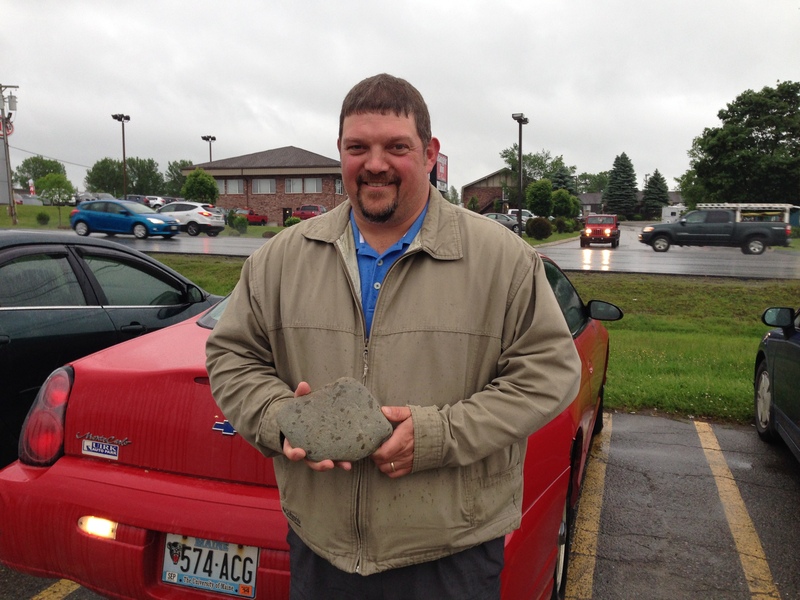 The stone that I carried today, to honor Jerry, was retrieved at his childhood home in Greenville. I want to offer my sympathies to Jerry’s family. I read the information you provided to TSP about Jerry, and I couldn’t help but smile thinking about him. “His quick wit was unmatched”. Jerry seemed like quite a character, his crooked smile, his good sense of perspective, sarcasm, enjoying life and being silly. When myself and six of my friends arrived at both the summit of Maiden Cliff, and again on Mt. Megunticook, we spoke of Jerry, his service and dedication to the military. We imagined what he would have been like to have as a friend, and we all agreed that he sounded like a wonderful person, full of life. Jerry was someone that would have been fun to have around. Also, the fact that Jerry was an athlete and loved hiking, really hit home with us. A life taken too soon, but never forgotten. Thank you to TSP and Jerry’s family for sharing his story. Thank you to all the hikers who have carried Jerry’s stone to their summits. I had not heard about this project until just recently. Jerry’s mom, Fonda, is my 1st cousin. I was fortunate to be able to see her in Greenville just a few short weeks ago. I did not see a lot of Jerry growing up – I live in Virginia. I do remember hearing about the navy jet that crashed off the coast of North Carolina, not knowing that it took my cousin’s son with it. When I learned of the connection, I was heartbroken for her – I knew her husband (Jerry’s father) was in bad shape himself; he passed not long after his son’s death. I thank each and every one of the people who have carried Jerry’s stone with them on their treks. I know it means a lot to his family. Thank you for your comments and your caring. HUMBLE: Modest. Having feelings of insignificance, inferiority or subservience. Courteously respectful. Small in size. COMMIT: To pledge to a position on an issue. To entrust. To pledge to engage oneself. THANKFUL: Feeling or expressing gratitude. Appreciative. On the TSP @ ANP 2016 hike, I was HONORED and HUMBLED to be carrying the stone and story of Lt Jerry R Smith. Before the hike, I joined the Facebook page, “In Loving Memory of Lt Jerry R Smith.” Here, I was welcomed into a community remembering Lt Smith. I was given encouragement and energy in the week leading up to the hike. After the hike I hold with me the feelings of COMMITTMENT to and being THANKFUL for being part of something bigger than myself. I had the privilege of carrying a stone as a memorial for Jerry Smith up Streaked Mountain. I loved reading about Jerry and what kind of person he was and what he did to protect me, my friends, and family everyday. I loved learning about Jerry. It made me very happy to hear that he always told jokes and was able to laugh. It sounded like he could make the best out of any situation he was in. I love the fact that Jerry had such a good sense of humor and loved the 80s. I am always making jokes and i live and wreath he 80s and making bad situations better. I feel like Jerry and I would’ve gotten along well. I also learned that he grew up in Greenville, Maine. I also found out his brother Eric, and mother. Fonda, found the stone tom honor him in a flower garden from their childhood home in Greenville. I am not from Greenville, but I am from Maine as well, and this is home to me. Lots of meaningful places are here. It seemed as if Jerry had a good hold on life and what it threw at him. He came from a very long history of public servants, and he knew joining would be the right thing to do. He didn’t just do it for himself, he did it for the legacy that was his family. Carrying the rock up the mountain was a privilege. I did not realize how big of a privilege it was until I reached the top. The hike was not easy and it felt so good to finally make it to the top. I realize what I did doesn’t equal even a fraction of what Jerry did for not only me but the country I live in. I hope Jerry was watching us and I made sure to make jokes all the way up to honor him because I almost feel like thats what he would’ve wanted. Thank you for giving me the honor of carrying Jerry with me. I hope he had just as much fun as I did. Jerry R. Smith is a hero to me. I did not know him before I participated in The Summit Project hike from the Portland Jetport, but once I finished the hike it felt like I knew him a lot. I think that I have a lot in common with him. I have a good sense of humor and I am also sort of athletic. When I first got his stone and started walking with it, I got a tiny bit emotional and tears started welling up in my eyes. To LT. Smith’s family and friends, I am very sorry for your loss. To have someone or something reach into your core, what some call the soul, and transform it. Now, whether or not we accept this transformation coherently and directly put it to use or, it affects us later in life, the truth is that the experience is forever. There is a certain feeling,I cannot explain, that I have had since my experience with The Summit Project at Baxter State Park. It’s similar to the feeling you get when you understand one of the basic emotional components in our system – compassion. I honored the memory and life of LT Jerry R. Smith over Memorial Day weekend. One of many soldiers that this great state has lost since September 11, 2001. Every moment I spent surrounded by people experiencing similar, if not the same, feelings were moments I know will live on in me forever. Reading the stories of others who have carried the stone and story of a man who, like me, was very much ready for anything, and seeing that some actually knew Jerry made me very happy. I know it’s a simple word but, happy I am. As I reflect more, I hope to be able to effectively communicate what I experienced to others so that lives continue to be spoken of, stones continue to be carried and stories continue to be made. Lives never cease if their stories are told forever. The burdens of sacrifice fall upon the shoulders of the ones left behind. I am honored to have been able to carry a stone that simply was not a stone at all but, rather a living memorial to those who step fearlessly into the fray so that we can decide freely what our lives will be. I carried the stone and the story of United States Navy Pilot Jerry Smith. I would like to personally thank you for sharing Jerry and his life with us and others who take part in this amazing program. Two weeks ago, Michael Keighley and I hiked up Table Rock Mountain in Maine with 44 teenagers who all have a parent or sibling currently serving in the military. They carried 28 stones up the mountain that day. Here is a letter from the campers that had the honor of carrying your hero. On 10/14/17, my son Colby and I took part in remembering our fallen heroes by hiking Cadillac Mountain with the Summit Project. Both of us hiked with Team Tarn. Colby carried the story and the stone of Private First Class Andrew R. Small while I carried the story and the stone of Lieutenant Jerry R. Smith. Colby and I got our stone assignments and we began to study our fallen heroes. PFC was originally from Wiscasset. PFC Small was killed by small arms fire on August 11, 2006 in Afghanistan. We learned that he sacrificed himself to give his platoon a better positon while they were under fire. He earned ten awards during his tenure in the army. Lieutenant Jerry Smith of Greenville died on August 15, 2007 while flying an E-2C off the coast of North Carolina. 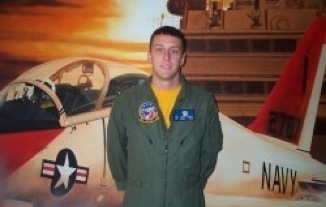 He was just days away from completing his final training in becoming a Navy Pilot. This was our second Cadillac Hike with The Summit Project (TSP). It was great to see our TSP family again. The day could not have been better. The weather was great and the group was terrific. Colby and I continued to remember the lives of our soldiers throughout the hike. As we made it to each break, we took in the breath-taking views as we did in past years remembering our mission and the sacrifices our heroes made so we can have such beautiful days. Our team made it to the top of Cadillac around noon time. It’s always a special event. I shared the story of Lt. Smith with the rest of my team. Colby followed shortly thereafter. We learned about the other stones that were carried throughout the hike. Words cannot express the mixture of emotions and feeling everyone gets during the ceremony. Following the ceremony, we returned to Smugglers Den where met with more TSP family, accepting our stones. We were honored to learn and honor two more heroes from Maine and are looking forward to future events with our TSP family, both new and old. I had the honor of carrying Jerry’s memorial stone and story to the summit of Cadillac Mountain on a beautiful fall day at Acadia National Park as part of Team Kebo. We couldn’t have asked for a better day. It was sunny and warm and the fall colors were showing some of their brilliance. I stopped several times and looked to the skies as I imagined Jerry flying over us and what the view was like from his perspective. I couldn’t have asked for a better team. We shared stories, laughed, cried, and laughed some more. We helped each when necessary and encouraged everyone along the way. Being first to the summit is never a goal. Team Kebo is typically first to the summit because it’s one of the shortest and easiest trails. I’ve been on this trail several times and stressed to the team to take our time, reflect on our mission, take in the scenery, and take every opportunity to talk to others about the heroes that are with us. A friend of mine told me that she spent summers with her cousins in Greenville. She said, “Always a friendly welcoming smile with a great sense of humor. Liked by all his peers. A person people gravitate toward. His death hit the community very hard”. From everything I could find, this perfectly summed him up. We could have used Jerry’s quick wit and sarcasm as we were telling stories of our heroes near the summit. A wedding party was gathering behind us. They were getting a little too loud, so we sent our biggest Marine to have a chat with them. I snapped a photo of him looking at his watch and thinking about how he’s marking the time that he needs to be back for the ceremony. The next time I’m in Greenville I will visit the memorial for Jerry and his crewmates. I believe Jerry and I would have gotten along. I can be very sarcastic, and when someone makes a statement that can’t be left alone, I have to make comment, politically correct or not (usually not). Luckily, there were many like minded people on our team and they handled it well. I will forever carry Jerry’s story everywhere I go. TSP is all about telling others about the mission of the organization, and any time I get the opportunity, that’s what I talk about. I tell them about the general mission of TSP, but I also tell them about the heroes that I’ve been blessed to honor. Maine Heroes Are Not Forgotten!